Ever since I first tried cooking a whole chicken in my slow cooker, I’ve been hooked. It gives me the most delicious, most juicy and moist chicken ever, hands down. They key is to stick it under the broiler for a bit before slow cooking it. This locks in the meat’s natural juices and helps deliver an absolutely decadent meal. However, if you prefer a more crispy skinned exterior, simply do the broiling process after the chicken is slow cooked. This step is super easy, and will really make a difference in the end product. I also want to note that because this is a whole chicken, the servings will vary in nutritional stats and Points, depending on which part of the chicken you eat and how large that serving is. On AVERAGE, each serving will range in 1-5 Points, WITHOUT the skin. This Weight Watchers Crock Pot Whole Chicken Recipe has gone into our regular meal rotation, because it’s undeniably delicious. The lemon and rosemary seasoning is my favorite, but you can play around with other spices and herbs as much as you like. 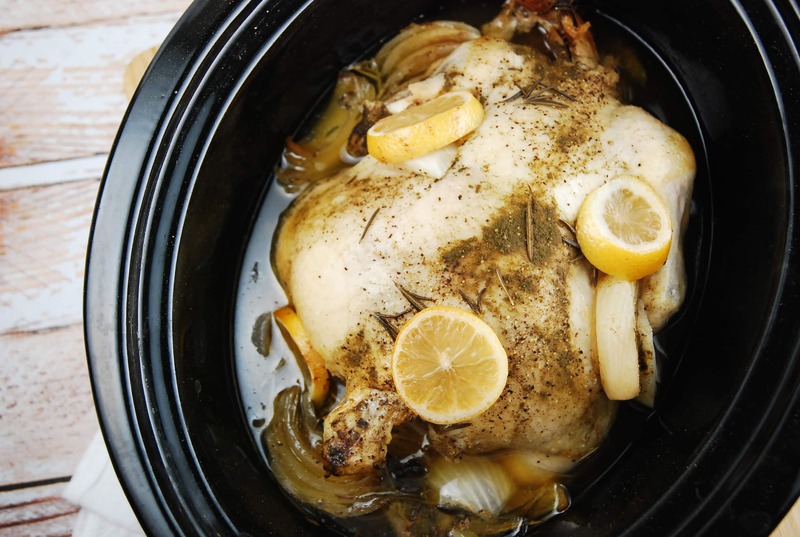 TIP: After you’ve removed all the meat, place the carcass of the chicken back in the crock pot with all of the leftover juices, lemons, onion, etc, add water, cover and slow cook on low overnight. The next morning strain out all the bits and you’ve got your own, homemade fresh chicken broth that is a zillion times tastier than any store bought kind! I freeze mine and save it for a future recipe. Seriously…DO THIS…you will love it! Succulent and juicy, this slow cooker chicken beats rotisserie chicken any day! The moist, tender, and wonderfully seasoned meat will absolutely melt in your mouth. Sprinkle the inside of the chicken cavity with salt and pepper. Then place half of the lemons slices, half of the onion wedges and 2 sprigs of the rosemary inside. Place chicken inside a small roasting pan. Spread butter evenly all over chicken, then season the chicken with the sage, garlic powder and salt and pepper. Place chicken in the oven and broil for about 8-10 minutes, just until the skin turns golden brown. If you like your chicken really darkened on the outside, leave it in until the desired level of darkness is achieved. ** To crisp the skin, you can do this step AFTER the slow cooking, if preferred. Place remaining onions and a few of the remaining lemon slices in the bottom of the slow cooker. Now place the whole chicken on top. Top the chicken with remaining lemon slices, and rosemary leaves (removed from string). Cover with lid and cook on low for 6 – 8 hours or high for 4 – 5 hours. The background color on your home page overwhelmes your text. Just thought you should know. I am designing my own page soon. Good question! The best way to make it fat free is by using a fat separator to remove the excess fat from the skin. That will get MOST of the fat out. But what’s left will be minimal, it most likely will not affect the Points Plus value of the recipe, so I wouldn’t count it as having any fat grams. i always freeze leftover broth with fat in it. then i can remove the fat that has risen to the top while it’s half defrosted. it comes off in big slabs very easily. whatever is left, i pretend isn’t there.